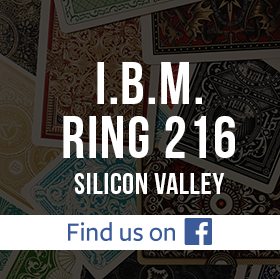 Join us on Wednesday, October 9, 2013, for the IBM Ring 216 Annual Close-Up Magic Competition. If you are interested in competing, please send an email to Cal Tong (calvin.tong@ring216.org). In addition to the standard division, we will also have our Masters Division if there are enough competitors. So if you have won first place in one of the competition events in previous years, then you qualify for the master's division and can sign up for this event! Read the competition rules for a general sense of how the evening will go. We will adjust the room layout depending on the number of guests and competitors. Rafael’s lecture will include commercial and practical items from his working repertoire, including card magic for the stage as well as for the table, coin magic, and his latest update on his well-known cups and balls, with new insight on this classic. His explanations will be full of practical advice that can help raise the level of all the magic you do, such as scripting, management, and handling of volunteers. Rafael Benatar was born in Venezuela and currently lives in Spain. He is one of the most active members of the prestigious Escuela Mágica de Madrid and one of the few magicians that performs regularly in all three rooms of the Magic Castle. Rafael Benatar is a recipient of the Linking Ring Parade of the Year award from the IBM. His DVDs received rave reviews from all major magic magazines. He has lectured extensively, in five languages, for magicians of many countries and this year was nominated by the Academy of Magical Arts for the Lecturer of the Year Award. In this hands-on workshop, Rafael Benatar will teach, with personalized attention, the finer points of some of his best card routines and original sleights, and his approach to card magic. His teachings will include advice on routining, on how to develop an appealing presentation, and systems to get the most out of your practice time. The workshop will be customized to suit the wishes of the attendants and the subjects covered will help you raise your magic to the next level. Coming this week: IBM Ring 216’s September Lecture by… Alan Sands (son of the great George Sands, AKA the Rope King).